Five Asian men who were convicted of taking part in riots in Burnley have won reductions in their sentences. Lord Justice Clark said the town's Asian community had been in genuine fear at the time and were on the streets to protect their homes. 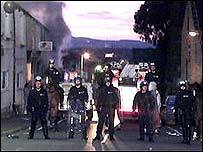 The Appeal Court was told that on the night of the riots in June 2001 an angry crowd of about 150 people had took to the streets after attacks by white gangs the previous day. Lawyers for the men argued that their sentences of up to three years had been excessive. Lord Justice Clark said that, while there was "no excuse" for the crowd's charging of a police line, the men's offences had not been racially motivated. He said the men were "lawfully on the streets" in response to a perceived threat to their community and the incidents had lasted less than three minutes, causing "relatively modest" damage. He added there were "stark differences" between the behaviour of white and Asian youths during the disturbances. He said: "In our view, the Asian group should have been sentenced on the basis that, unlike the white group, none of the offences were racially motivated." Tariq Saddique, 28, of Azalea Street, Blackburn, had his sentence reduced from three years to 18 months. Mohammed Bashir, 23, of Forrest Road, Burnley, had his term halved from 30 months to 15 and Asif Khan, 25, of Crankshaw Street, Burnley, had his reduced from two years to 14 months. Abdul Rahim Kayani, 19, of Brougham Street, Burnley, had his term in a young offenders institute reduced from 18 months to eight, meaning he will be immediately released. And a youth, who was aged 16 at the time of the riots and cannot be identified, had a 12-month detention order reduced to eight months - meaning he should also be released. Shahid Malik, a Burnley Labour politician who was wrongly accused of throwing bricks during the riots has won a public apology and "substantial" libel damages. Mr Malik, who is a member of Labour's National Executive Committee was angered when the allegations appeared in the Blackburn-based Lancashire Evening Telegraph on 17 January 2002. 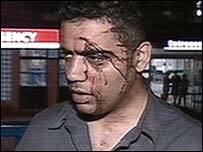 A local BNP organiser falsely claimed that Mr Malik had thrown bricks at a policeman and should have been prosecuted. The man had made the statement through his lawyers, Waddington & Sons, and one of its partners, Dylan Bradshaw, who have agreed a settlement. Mr Malik's lawyer, Tamsin Allen, told the High Court in London: "At the time referred to in the article, he was in fact acting as a mediator and peacemaker in a volatile situation following disturbances in Burnley."